Tasting Club Review - A Club For The Whisky Enthusiast? Home Subscription Boxes Alcohol Boxes Tasting Club Review – A Club For The Whisky Enthusiast? Tasting Club Review – A Club For The Whisky Enthusiast? Join today and get your first whisky shipment. For the whisky enthusiasts out there, there’s Tasting Club. It’s a monthly whisky tasting subscription (or quarterly for those who don’t want a delivery every month). Meant to enhance one’s ability to discover new whiskeys, it’s definitely one for those that demand quality. Every month, they choose a new whiskey expert that handles selecting the contents for that month’s delivery. This ensures they deliver an incredibly different flavor each month, which is what their loyal subscribers have come to demand. While it may seem that they have set the bar high, they earned our respect by living up to expectations. What Makes Tasting Club Unique? While a whisky subscription isn’t easy to come by, they still have no choice but to prove their value. During our review, a few things stood out about Tasting Club, which we felt would only be fair to feature for you below. An adventurer’s dream has come true. For those who love the history of whisky, its roots, distinct flavors from different parts of the world, this is the subscription to have. It contains diverse flavors of whiskeys chosen by a new expert each and every month. Don’t get stuck with wine, unless you want to of course. For the longest time, if you wanted a monthly box subscription with alcohol, you had to stick with one of the mail-order wine clubs. That was until the whisky clubs started coming up out of nowhere, and even now there are just a few really good ones, with Tasting Club being one of them. It’s a needed change for sure! Get a free wooden stash box with your order. Regardless if this is a subscription that you'd like long term, or if you just want it for a brief stint of time, the stash box is a great bonus. 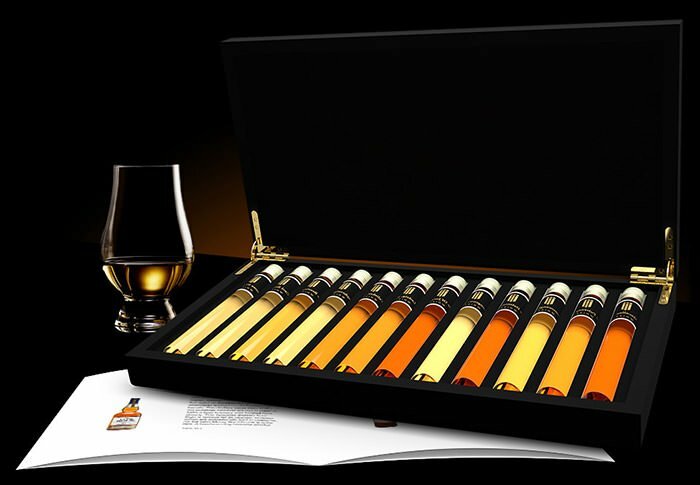 It’s meant to hold your tasting samples, but your imagination is sure to be able to make use of it even without the whisky. It goes to show they want to deliver a luxurious feel while you unpack the contents. A professional choice of alcohol, delivered. Full size bottles can be ordered, restrictions apply. Great gifts for employees, friends, and relatives. History and legacy is told to you with each box. Additional shipping costs may arise. Instead of bottles, you get small tastes. Price isn’t the most affordable in comparison. Nobody wants to waste the time or go through the headache of a complicated sign-up process that has been seen with certain subscriptions which we won’t mention here. Honestly it aggravated us what some people had to go through. That’s why we decided for each review that we do, we will cover the signup process in detail. Have a look at what it was like when we reviewed Tasting Club. A very minimal approach, when the industry embraces advanced processes. While other subscriptions use surveys and other tactics to deliver customized boxes, this is something that Tasting Club has yet to do. In fact you will be at their complete mercy when it comes to what you get. Now if you’re ok with that, fill out your shipping info. After filling out your shipping info, time for you to pay. Once you filled out all of the required information for a Tasting Club Subscription, it’s time to pay your bill and get your order shipped out. Just enter your credit card details, which will be used each time your subscription renews (monthly or quarterly). Your order will be shipped out quickly, and be on its way. Within 24 hours of the payment being received, they’ll ship your first box out from the warehouse. How long it takes will depend on your location as well as the shipping company that’s taking care of it. One of their biggest downfalls is the cost it comes at. While it could be more expensive, we feel they could improve the service by making the prices a bit more affordable. You’re getting vials that are just a couple of ounces, but are still required to pay a significant premium. The monthly subscription can be obtained for less than 40 euros (about $50) per month. Like we said, it’s not the worst nor is it close to being the best. As far as its value, you will get the experience you pay for but as for physical value, we can’t call it here. Since it’s a subscription service that’s based outside of the U.S., only those in the know usually come across Tasting Club. With that said, there aren’t too many customer reviews to go by like with the other subscription services. However, there is enough coverage for us to be able to say that they seem to be on top of providing support. While they may not be a US based company, they still provide great service to the states. When compared to the limited selection of competition, the price is pretty high. However, if you combine it with one of the other leading subscriptions it has the ability to give you a diverse taste to add to your collection. While the price is high, the quality is high as well. They do take time to make sure each box delivers a rich meaning, and it's not selected by the same expert month after month. So with that said, maybe the price isn’t ridiculously high due to the attention to detail they have. Are the products able to be returned? If the box contained the correct contents, you can’t return the items. You can only return them if the shipment is damaged upon arrival or if it doesn’t contain the right products that come with your subscription. Can I set my Tasting Club account up to be invoice-able? This is only available on large orders, and you may want to visit their website or contact them directly to discuss this in more detail. Normal sized orders will not get qualified to be invoice-able for their Tasting Club subscription as they’re to be paid for up-front. Can you share a little more about the tasting tube? They say that the tube contains enough for 2 people to get a good taste. It’s a size of 25 ml exactly, so it’s nowhere close to being the amount you normally get in a bottle. If you want bottles, this subscription isn’t for you, unless you’re willing to order them separately. How soon is my first box shipped after ordering? The goal of the Tasting Club is to have all orders shipped out within 24 hours of receiving them, including the payment required. In certain cases it can take longer, but usually it will be in the mail within 24 hours and they’ll email you the shipping info once available. If ordering outside of the Netherlands, what do I need to know? If you reside in the Netherlands, this is a great deal as they’ll cover the cost of shipping. However, things do get different when going to other countries depending on exactly where you’re located. While they pay the local duty tax, you would be required to pay any required tax by your federal government. As well as be in compliance with customs. The Tasting Club is targeting large spenders, so if saving a buck or two is your intention, you might want to try something else on for size. However, if you want special whiskeys delivered to your door and the cost doesn’t matter, it might meet your need. They carry top shelf alcohol and have targeted their concept to be around fulfilling the needs of whisky tasters. Those who want to try something new before they add it to their home bar. The Tasting Club is a strong company in the space, but its value has to be determined by you. If you find that the price may be hard to swallow each month, just follow your gut. It would be disheartening to get your first month, but on the 2nd month you might find that it is an unrealistic expense which you can’t make right now. Make sure that you explore this before even taking the time to enroll in the Tasting Club subscription. There are cheaper options available, so it’s not your only choice. While not the "budget" alcohol service, Tasting Club certainly meets a unique market need. This service is expensive, though as it's a quality whiskey service, this price is within a reasonable range. If you're on a tight budget, you'd be better off looking elsewhere. However, for those with the funds to try a variety of special and quality whiskeys, this service it at least worth a 1 month trial run. Previous articleTasting Room Review – Is Lot18's Wine Subscription Box Any Good?